How much will a custom wedding gown cost? Custom gowns begin at $3000. This includes the initial sourcing, sketching, pattern design, garment construction, every fitting, alterations, communication and a fashion painting of the gown. Each dress is unique as the bride, and so the quote for each dress will be unique as well. In general, it takes at least 60 hours of skilled labor and a minimum of $500 of materials to create the gown from the initial idea to the finished product. It is possible to spend $10,000 to $15,000 or more on beaded gowns where the beadwork has to be designed from scratch and done by hand. How much will wedding gown alterations cost? Normal wedding gown alterations range from $200 to $800. We need to see your gown in person to be able to give you an estimate. Cost varies based on the fabric, details, hem style, number of skirt layers, type of bustle and more, and the number of alterations required. Gowns with extensive bead work, complex detailing, or that need to be completely restyled may cost more. How long does the dressmaking process take? The process takes approximately 2-4 months to complete a custom gown, but gowns have been completed in less time. Please reach out and we will assess on a case by case basis. I don’t live near you. Can I still take advantage of your services? Yes! Make a vacation of it and visit Maui! Custom dressmaking is a very personal affair, and requires a minimum of five fittings, sometimes as many as ten. So, we need to be together to make your dream come true. Maui is a wonderful place to visit with your fiancée, family or friends. You can combine a memorable vacation with having your custom gown made. Depending on the complexity of your dress, you may need to make two trips to Maui – one for the first round of fittings, and one for the second round of fittings. Plan on spending at least a week here, with a fitting every day, as we progress through your gown. After the second round of fittings, your dress may be complete or may need finishing work done. Once the dress is complete and ready to be delivered, you will need to come to Maui for a final fitting and to pick up the gown. We can also fly the completed gown to you. Please inquire. Where will we have our fittings? The sewing studio is located in Makawao at 3660 Baldwin Avenue on the 2nd Floor. Fittings are by appointment only. Enjoy the neighborhood restaurants and shops in Makawao before or after your fitting. Check out www.makawaomerchants.org for all the restaurants and shopping in upcountry Makawao. What is the process for having a custom wedding gown made? A detailed description of the process can be found here. What types of wedding gowns do you alter? We work on all types of gowns, from new couture designer gowns, to your mother’s gown that you may want restyled, to beautiful consignment gowns. We work with all types of fabrics, including silk, satin, charmeuse, organza, chiffon, lace, intricate beadwork, and more. We restyle gowns by taking existing dresses and adding or removing certain elements to create a dress that is special for you. 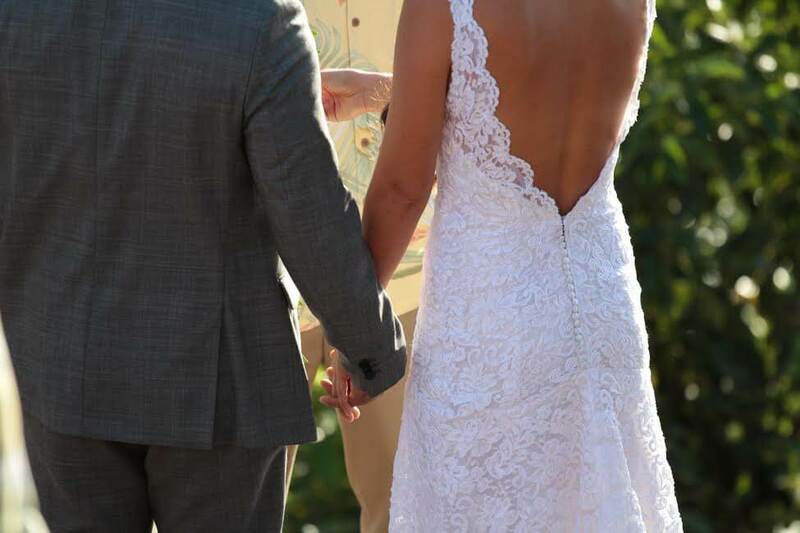 When should I bring in my wedding gown for alterations? The sooner, the better. Schedule your first fitting appointment as early as possible to be sure your dress gets into our queue, and our staff has plenty of time for alterations. Ideally, we like to have wedding gown alterations completed months in advance of the wedding. The final weeks before a wedding are generally very busy for brides, so we like to cross the wedding gown alterations off your list early. If you have been a stable size for a long time, and do not plan on losing weight, we encourage you to come in early and have your alterations done. We try to leave the final four weeks before a wedding day for those brides who are in the process of losing weight, have found their gown at the last minute, or have an alteration emergency. I plan on losing weight before my wedding day. When should I come in for fittings? Again, the sooner, the better, so that we can get you into our queue. We will schedule your fittings within six weeks of your wedding day. Two weeks out from your wedding day, we suggest that you maintain your weight so as to not have any last minute alteration emergencies. What should I bring to my first bridal fitting appointment? Please bring your calendar, wedding date, shoes and undergarments. If you do not have your shoes yet, please bring shoes that are the closest in height to what you will be wearing. If you are unsure about undergarments, please bring several options and we will be happy to assist you with the correct choice. You may also bring your veil, jewelry and other accessories. Please bring your preferred method of payment since a deposit will be required at the first fitting. Can someone come with me to my fitting? Of course! We have designed our fitting room so mothers and bridesmaids could accompany you during these appointments. 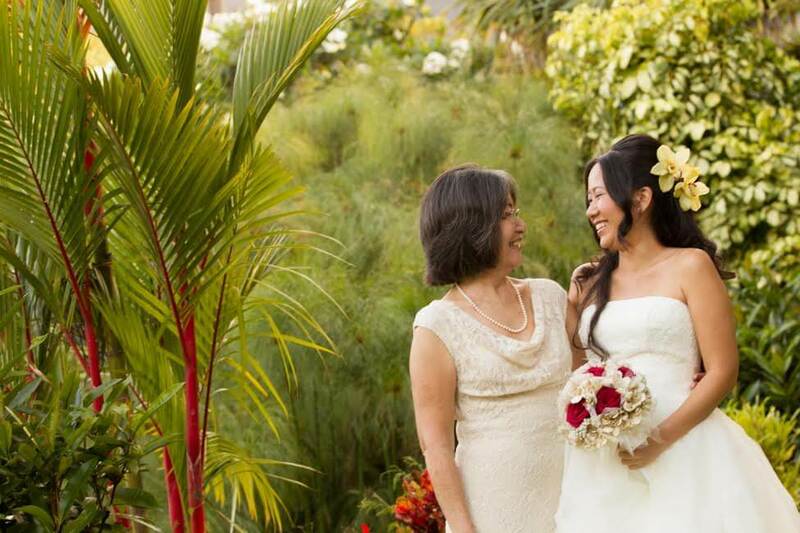 Do you work with mainland brides getting married on Maui? Yes, we do! 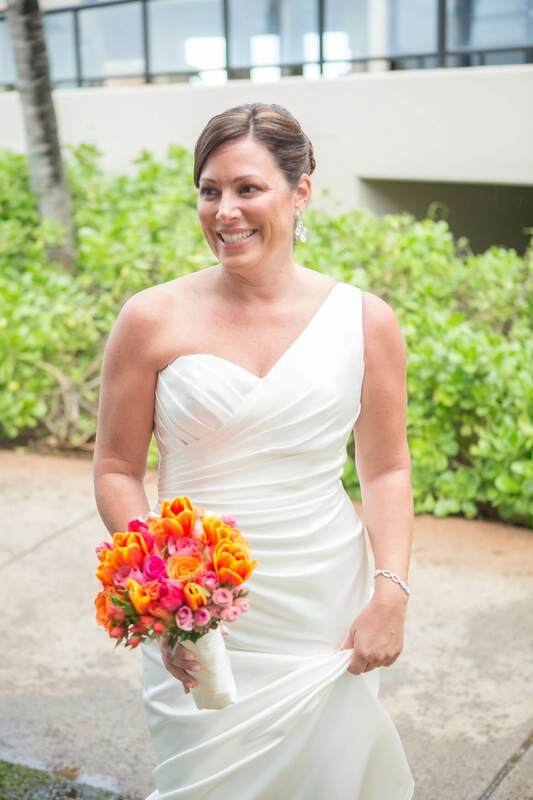 If you are visiting Maui for your wedding and need on-site pressing, steaming or emergency alteration services, please give us a ring at 808-757-5915. We can travel to your hotel or wedding venue and bring sewing machines, pressing and steaming equipment, and sewing supplies. Read more about those services here. Do you alter bridesmaids dresses? Absolutely! We work with bridesmaids as well as mothers of the bride and groom. Yes, we love to! We work on both men’s and women’s clothing. Whether your style is trendy, casual, elegant, preppy, rustic, professional, artsy, bohemian, tomboy, rocker or sporty, we can make your clothes fit perfectly. Read more about tailoring services here. Yes! Check out our classes here.